Slim, capacious and for the right price. What's not to like? 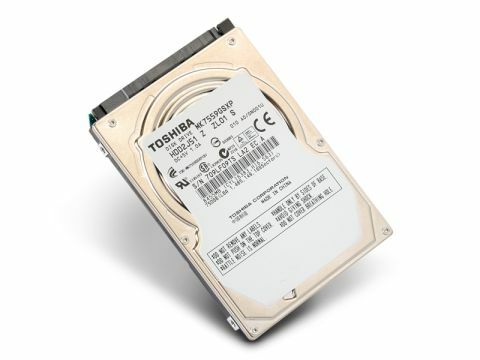 Toshiba has launched a huge 750GB capacity 2.5-inch drive in the shape of the MK7559GSXP which you can snap up for around £80. To put the £ per Gigabyte argument into some sort of perspective, for the same amount of money you might just be able to buy an 80GB SSD if you shop around. Even just a couple of years ago a 750GB 2.5-inch drive would have been nudging the £200+ mark. With this tiny 750GB drive, Toshiba has a drive that should help address the data capacity needs of today's multimedia notebook aficionados. It's interesting to see how the MK7559GSXP with its latest mechanical drive technologies outperforms the previous generation MK5055GSX. The MK7559GSXP loses out to WD Scorpio Black in the random access results due to its slower 5,400rpm spin speed, WD's drive spins at a much faster 7,200rpm and has a massive16MB buffer.